The photo above shows the basic screen when you click the icon, and under each heading (starting with Horse Stats) you will find some really helpful statistics. Below we’re going to explain what’s under each heading and how you can use each one to improve your betting. Before we start, it’s important to remember that Stats aren’t the be all and end all of betting and trading, however the more you know, the more informed your decisions will be. The good people at ProForm have supplied us with a helpful graphic below that will explain what each column, or heading, means on the basic card. While we’ll go into a bit more detail to explain the stats below. So once you’ve read the above image and understand the basic card format, we’ll start with the Stats. The top four obvious places to start are; current Trainer form, Trainer course record, Jockey course record and Trainer and Jockey record together. 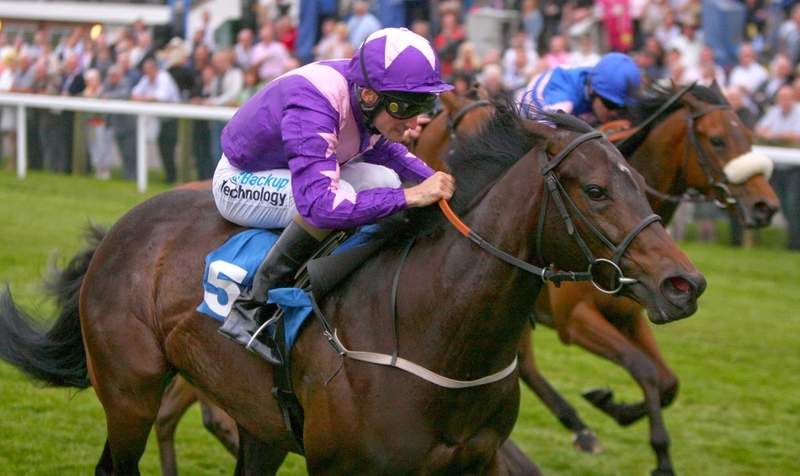 A hugely important factor as to how each horse will run is current trainer form, a really long poor spell could point to a problem in the yard, and you’d want to avoid backing a favourite in that scenario – it could even become a huge value lay, which obviously makes BETDAQ’s exchange more attractive than a traditional bookmaker. In the below photo, you will see “Trainer 14+ Day Statistics” is broken down into 14 days, 28 days and 56 days – it shows you how many runners the Trainer has had, how many wins and how many placed, this is under “W-P-R.” The most important figure here, as it is for every stat you will see, is “Exp” which means expected winners – this is a figure based how many winners the trainer should have had during this period. The next two important factors are Trainer course form and Jockey course form, if you like following trainers these statistics will easily point to where they like sending their horses too. For example a trainer may have a good record over hurdles at a particular track – that positivity will always be in the back of his mind and thus he’s likely to send higher quality horses there is future. How a jockey rides a track is important too, and while this may not have as much importance as trainer record, some stats can throw up interesting theories, for example if a jockey has a poor record at a track with a long straight but a good record at a track with a short straight, does that mean he goes for home too early on the long straight and runs out of horse by the line? There is any amount of conclusions to draw from the numbers – you just have to pick and choose what’s important to you. Below is an example of jockey course record Stats. After that, you have your trainer and jockey record together, this may not be as big a factor as current trainer form, or trainer and jockey record at the track – but it is a good indicator as to how a partnership is doing. It can certainly point to a gamble or two, if you see a trainer putting up a jockey that he only sparingly uses. We’ve had some examples where a trainer has won with 7 of his 11 runners when he employed a certain jockey. Below is an example of what the trainer and jockey combo page looks like. Another important factor to note when looking through the above stats is the “Chi,” this is the little column on the right, and it tells you how much of the statistic is down to luck. Ideally you’ll want the stat to have as little luck as possible factored into it. 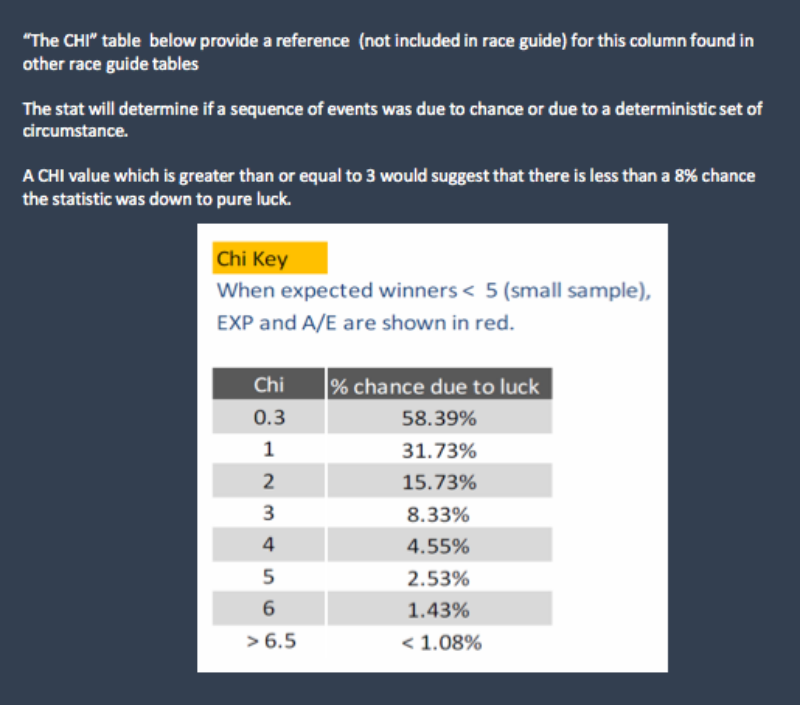 And the below image explains what percentage is down to luck based on the Chi figure. The image also explains why some figures are in red too, this simply means there isn’t enough data on the particular stat yet to be fully confident on it. If you just like these basic four headings, then you will be pleased to know that we do all the hard work for you each morning so you don’t have to. Our ProForm Stats article each morning will list the best stats from the day! However, if you want to go into more detail, we’ve got you covered here too. 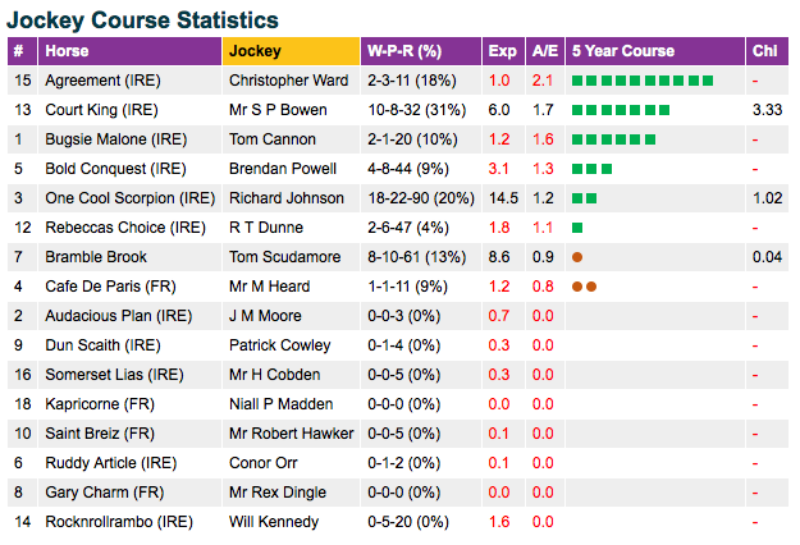 If you like betting in running, then our ProForm Stats can help you there too. You can see what the record is like for horses who lead, are prominent and are held up in the image below. It also gives a rough guide on where to expect jockeys to position their horse during the race. At some tracks these stats can be key, and its highly likely you’ll be able to get a good in running trade from a front runner. And if you’re a favourite backer, you can check the stats there too to see how past favourites have performed. It might not be as big an indicator as some other helpful stats though. So after you’ve checked all that, and the heavens have opened – now the question is can your selection go on the ground? Well, you can check that too. A key indicator as to whether or not a horse will perform on certain going, is their sire. 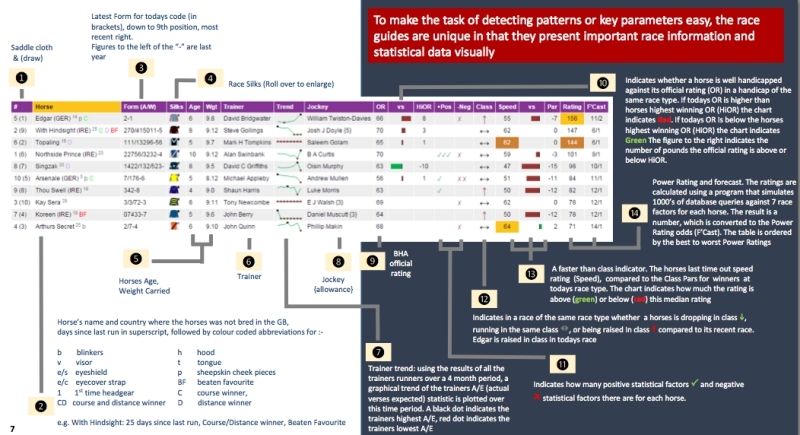 Now, this obviously doesn’t apply to every horse, but it applies to a very large percentage of horses, and you can check how their sire performed on each type of ground, while also checking the distance. If your selection is older, you can check how they have performed on each type of ground too. An example of all this is shown in the three images below. 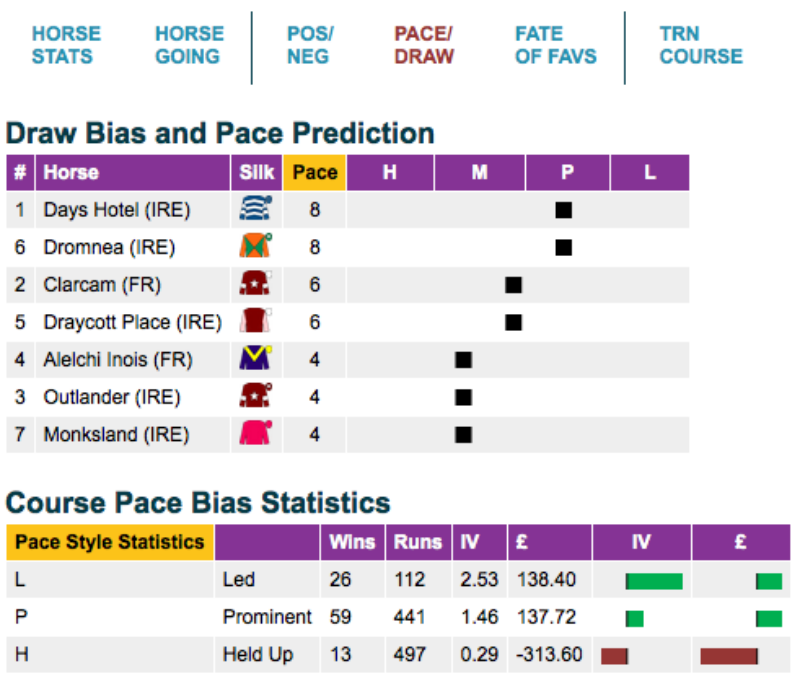 And last but not least, if you’re feeling a bit lazy and you have just read our ProForm Stats daily article, you can also check out something similar with the POS/NEG button on ProForm Stats, this will list things like; First run after switching stable, whether a horse trades lower in running, how they perform after a large break, what record with headgear the trainer/sire may have along with many more interesting stats. So there you go, we hope you found this article helpful. Using our free ProForm Stats can really improve your betting decisions and help you become a far better trader or punter. If you have any further questions about ProForm, feel free to get in contact with us through the BETDAQ Twitter where we’ll be on hand each day to help with any questions! PreviousHAYLEY TURNER: Happy New Year ! !